December 21, 2014 .Reading time 9 minutes. My wife sat at her laptop furiously compiling the lists for our four girls. She checked it once, then again while travelling to website after website scouring the internet for the best price and delivery. Items were added to baskets and carts checked out at such a frantic pace that I literally felt a warmth emanate from the credit card in my back pocket. Shopping at a fever pitch – Christmas delivered in two days or less. Not like most years, where she disappears for hours on end to find the perfect gift at the mall. She doesn’t have time for that this year because we got cancer for Christmas. We d idn’t ask for it. It wasn’t circled in the wishbook or written in red crayon. No one sat on Santa’s lap and begged for it. No, cancer just showed up unannounced and took our year away. So rather than spending quality time with each of the girls to weigh their enormous wants against our limited budget as in years past, she spent Saturday morning hunting and pecking under great duress. Do they have the right size? Will it be delivered on time? Is that really something she will use or should we just give her cash? At some point during the madness, I asked her what she wanted for Christmas. She paused to consider. Her eyes got red and her mouth failed her. She didn’t answer, but I knew. I knew what she wanted the second I asked the question and Amazon.com can’t deliver it, even though we are Prime members. It is the only thing either of us want. June 12, 2014 .Reading time 4 minutes. “I can only find three leg hairs” observed my youngest from the back seat. The chemotherapy killing her tumors also attacks any fast-moving cells – thus the hair loss, fingernail lines, and white blood cell reduction. She is twelve and had kind of fuzzy, blond legs a couple of months ago. Her smooth legs weren’t troubling to her, just something she noticed. “Well, that would come in handy if you cared about that stuff yet,” I said, glad she didn’t. A very interesting question. Who did start that? I assume Eve had leg hair when Adam popped the question. 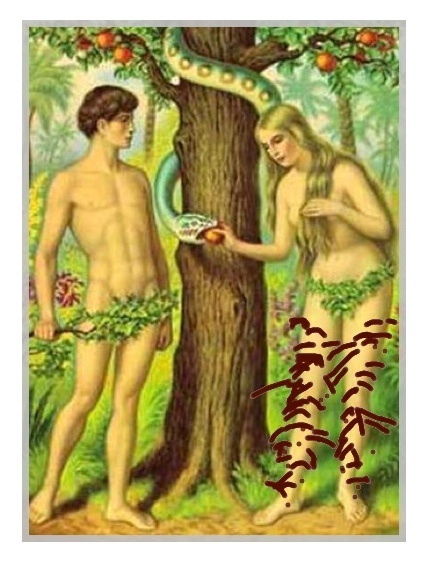 Do you think when they ate from the tree, not only did they figure out they were naked, but Adam also noticed her furry legs for the first time? Did he made a snide remark about Eve being only a slight step up from his former companion, the chimpanzee? Every guy knows the remorse of SCS – Stupid Comment Syndrome. The moment you say something to your wife and immediately wish you could turn back time to retract it. Adam’s comment sent Eve into a tizzy trying to scrape the hair off with a stick while stitching together the fig leaf bikini we see in all the pictures. If God created enmity between woman and serpent, imagine the enmity Adam created with his wisecrack. Ah, here is where I began a quest for knowledge. I had no interest in important knowledge, anyone can get that. The learning I sought is practically irrelevant outside of bar bets, board games, and trivia competitions. When did women first start shaving their legs? Where do I turn? My best friends and cohorts in the immaterial: Google and Wikipedia, of course. Google brought me facts that I have to believe. It seems that women were so covered before the turn of the 20th century that it wasn’t necessary for them to shave – their body hair was kind of a honeymoon surprise. But as hemlines raised in the early 1900’s, razor sales increased. I can buy that. The more compelling facts I found were about why women began shaving their underarm hair. They involve motion pictures, flappers, and old western women of ill repute. I would explain, but everyone likes a cliffhanger. My true audience is only twelve and wanted to know about leg hair anyway. Besides, while on my search, I found a website called Mental Floss. It is like a Mythbusters of the inane. My evening was shot. I learned why bacon smells so good, 15 reasons we love Mr. Rogers, and why baby names have become increasingly female-sounding. Forget Wikipedia, some of that might actually be true. I have a new homepage! After about three hours of copious research into absolutely nothing worthwhile, my daughter asked me why women started shaving their legs and I had to admit that I could tell her all why cows moo with accents, but had crammed so much useless knowledge into my finite brain, I had forgotten why women shaved their legs. But wait – an article titled, Do Racehorses Really Pee All That Much simply has to be read!